Pick up from the airport and transfer to hotel and rest a day in hotel. Pick up from the hotel at 9.30 am and Proceed to Visit Old & New Delhi – Jama Masjid, then Walking and cycle Rickshaw ride(as per your interest) in Chandni Chowk Market to explore – Kinnari Bazaar(Wedding Market), Parantha Wali Gali(Indian Stuff bread-Breakfast Street), Textile Market(Wholesale Textile Market), Books market(Books, Notebooks, Wedding cards etc), Spice Market(Grind and Whole Spices) also visit Fateh puri Mosque, Sis Ganj Gurudwara, Jain Temple, Shiva Temple etc and also taste Indian Local street food with us and later visit red fort(out side) and then to Raj ghat(Mahatma Gandhi memorial), And proceed to visit New Delhi – India Gate(War Memorial), President House, Parliament House, Himayun’s Tumb(Ideal of Taj Mahal), Qutub minar(tallest minaret in India), Lotus Temple(Bahai House of Worship), etc and rest in same hotel. Pick up from the hotel after breakfast and Proceed to Agra on the way visit Sikandra fort(Tomb of Akbar the Great), Baby Taj Mahal(Etimud-ud-Daula) and Taj mahal from back side and Red Fort-Agra fort( a UNESCO World Heritage site located in Agra) and transfer to hotel and rest a day in hotel. Pick up from the hotel at 6.30am and proceed to Visit Taj Mahal(Symbol of Love) at Sun-rise then come back hotel have breakfast and Proceed to Jaipur on the way visit Fateh-pur-sikri(Fort and Sufi’s place) later check inn into the hotel and rest a day in hotel. Park vehicle Pick up you from the hotel and enjoy Canter/Jeep Safari(3 to 4 Hrs. 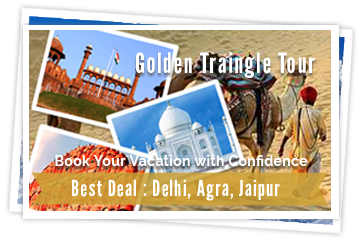 ride) as per interest and check your luck to saw the Tiger and later come hotel have some rest and check out from the hotel and proceed to Jaipurand transfer to hotel and later proceed to visit monkey Temple-Galta ji and Birla Temple and rest in hotel. Pick up from the hotel at 8am and proceed to Visit Jaipur-Amber fort(oldest capital of Jaipur)(if interested in elephant ride it cost for one elephant Rs.900/- for two person or ride one person), Water Palace(Jal Mahal Palace amidst in Man Sagar Lake), Hawa Mahal(Window Palace-Crown of Lord Krishna), City Palace(Museum 7 palace of Jaipur King), Observatory(Jantar Mantar), Gaitor(Cenotaphs with typical Rajasthani Carvings), Ishwari Minar Swarga sal(Watching Tower of Pink City), Old Pink City walking or Rickshaw ride(as per your interest), etc and rest in same hotel. After Breakfast or as per your flight schedule pick up you from the hotel and Proceed to Delhi/Jaipur and transfer to airport to catch the next flight to back home. All Disposal & Sight seen by Air conditioned Car, etc. If you using Express highway to go to Agra it cost you $-10/- in total as extra toll tax. Guide in Fatehpur Sikri not provided by us because as per our experience the better option for there to have an Audio Guide to visit the Sikri and Shrine Palace of Fateh pur Sikri.